I recently bought an SSD and installed Windows 8 on it for my laptop. I will hopefully write a blog post about this process soon. 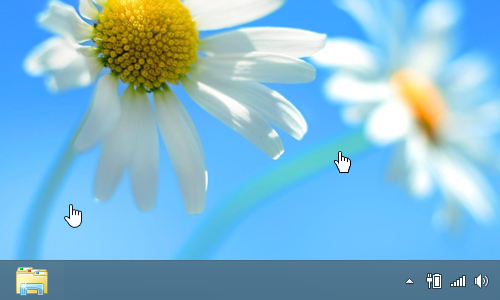 One of the things I noticed about the Windows 8 cursors that bugged me was the link hover cursor. It has a new curved base on it and I find it too big and out of place with the rest of the cursors and Windows 8 in general; as most things in Win 8 are square, not round. I was put off enough that I decided to make my own link cursor based on the Windows 7 one. It is the same as in Win 7 except the grey gradient has been removed to fit in with the other Win 8 cursors. I know it’s a little thing but I think it’s made a big difference as the link cursor is seen often when browsing the web. I much prefer it to the default one. If you want to download and use it, I have uploaded it to Dropbox and you can get it here. To change the cursor in Windows 8, search for ‘change how the mouse pointer looks’ scroll to the bottom and double click the ‘link select’ cursor. Choose the new cursor from where you downloaded it to and press OK. That’s it. Enjoy.